Finally a treatment for excessive underarm sweating known as axillary hyperhidrosis. MiraDry is a lasting solution that can make excessive underarm sweat a thing of the past. The miraDry procedure doesn't involve surgery, needles or injections. The miraDry procedure non-invasively uses electromagnetic energy to eliminate sweat glands. Because the sweat glands do not regenerate after treatment, you should see a dramatic and lasting reduction of underarm sweat. MiraDry takes about 1 hour to be performed in the doctor's office. Two treatments "USED" to be required. But more than one half of the practices we talked to explained that a new protocol was introduced recently where "most" patients only require 1 treatment.. The highest price for MiraDry for two treatments that we found was $3,100 and the lowest was $2,500. The majority of practices we talked to described it as "rare" to require 2 treatments. The question to ask a provider is how many of your patients require two treatments? Can MiraDry be used to Stop Underarm Odor? 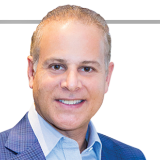 Dr. Stephen T. Greenberg now offers miraDry in his Glisten Skin & Injection Spa.